Hello everyone! 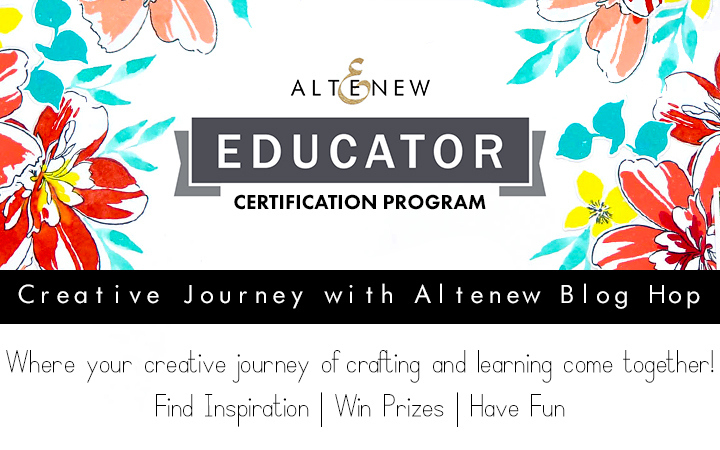 Welcome to Altenew Educator’s Blog Hop! If you’ve been following along, you’ve just arrived from Patty Mello’s blog. If you find a broken link, you’ll find a master list of the hop links below and at the Altenew Card Blog. This is my very first blog hop AND my very first time to create a video tutorial, so I beg for your indulgence. It was a great learning experience. 🙂 I didn’t realize how much time and effort it took to film and edit a video (or was it just me?! ), so hats off to all my card-making idols out there who unselfishly share their time and talents through video tutorials!!! As Altenew-certified educators, we were asked to share our FAVORITE techniques, styles or Altenew supplies. Oh dear…I have too many favorite stamp sets!!! 😀 It took a while for me to narrow it down to 5 and here they are in no particular order. The Needlework Motif Stamp set is just beautiful. The floral design is so intricate and delicate and it can be used in so many ways. You can find the video tutorial on how to create the Needlework Motif card below. To change it up a bit, I thought of stamping the images over black cardstock and I was not disappointed. This made the Altenew rose gold embossing powder stand out against the black background, thus making it more striking! Moroccan Mosaic background die was used to cut 4 sheets of black cardstock. These were stacked up and glued together to give dimension to the background. The Needlework Motif image was stamped on black cardstock using clear embossing ink and embossed using Altenew’s Rose Gold embossing powder. Finetech Artist pearlescent Mica watercolors were used to color the image to add shimmer to the card. A strip of thick vellum was colored with Finetech watercolor then the sentiment was stamped in black and embossed with clear embossing powder. 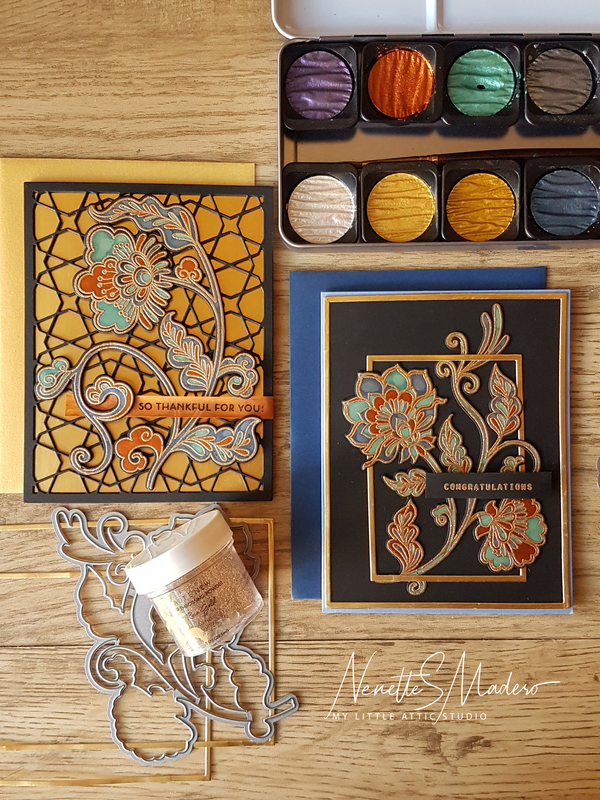 The layered black Moroccan mosaic die cut was then adhered to a gold A2 side folding card and the image was attached to the center. The sentiment strip was tucked under the swirl to add more interest. Same procedure was done to the image as card 2 but this time, gold frames using Altenew’s Fine Frames were used to bring focus to the stamped image. Another favorite of mine is the Persian Motifs stamp set. I made this layout sometime ago but wanted to share it with you. 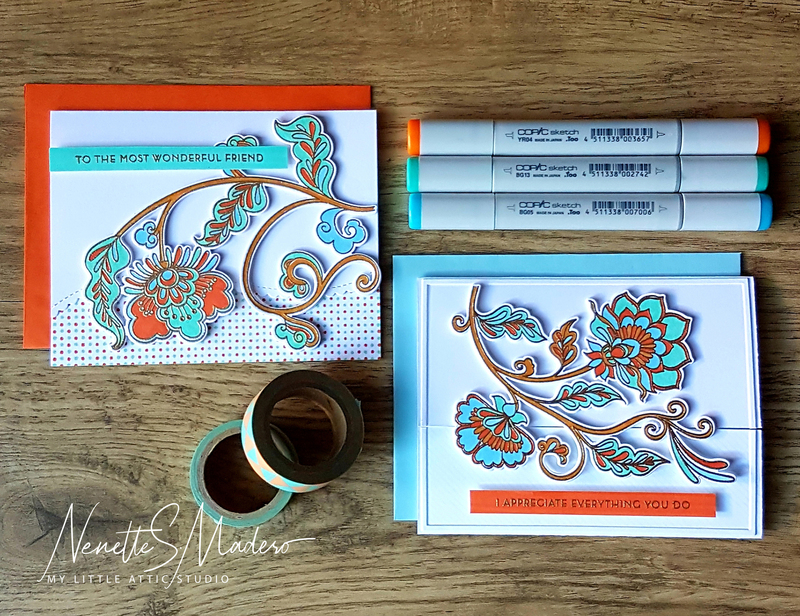 I love how Altenew stamps and dies are so versatile and can be used to make your own embellishments for scrapbooking layouts. The flowers were stamped on watercolor paper using clear embossing ink and embossed with white embossing powder. Wet on wet technique was done to color the flowers using distress inks. The other layers of the Handpicked bouquet were stamped with the following Altenew dye inks: Frosty Pink, Coral Berry and Rubellite. 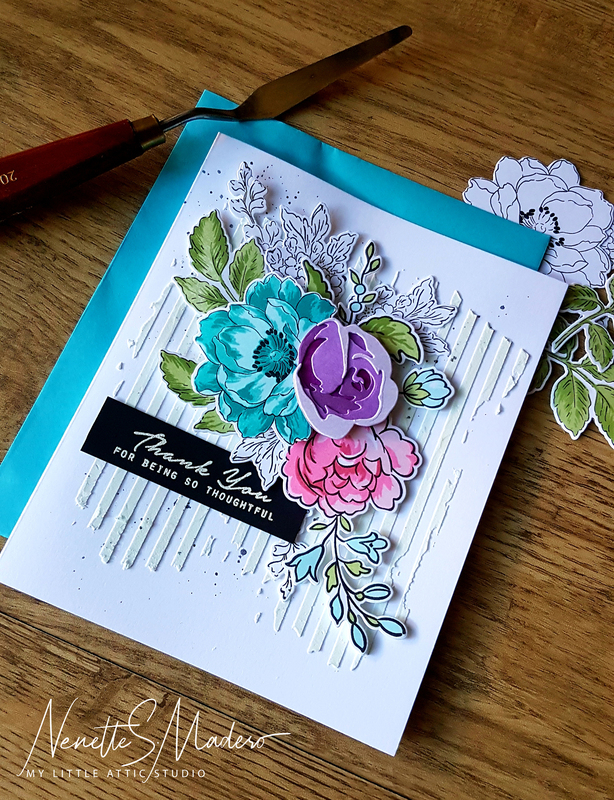 The Beautiful Day flower layers were stamped with Dew Drops, Aqualicious and Teal Cave. I used Frayed Leaf and Forest Glades for the leaves. The other flowers and foliage were left uncolored so that the 3 main flowers will stand out more. 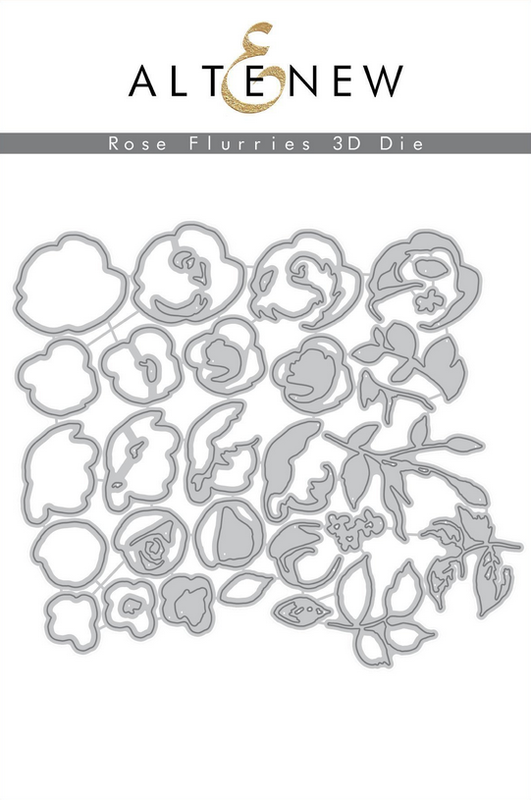 The biggest rose from the Rose flurries die set was die cut using white cardstock then colored using Soft Lilac, Lavender Fields, Deep Iris and Midnight Violet. TIP: If you do not have a darker shade of ink, just stamp the lighter color multiple times to create a darker shade. 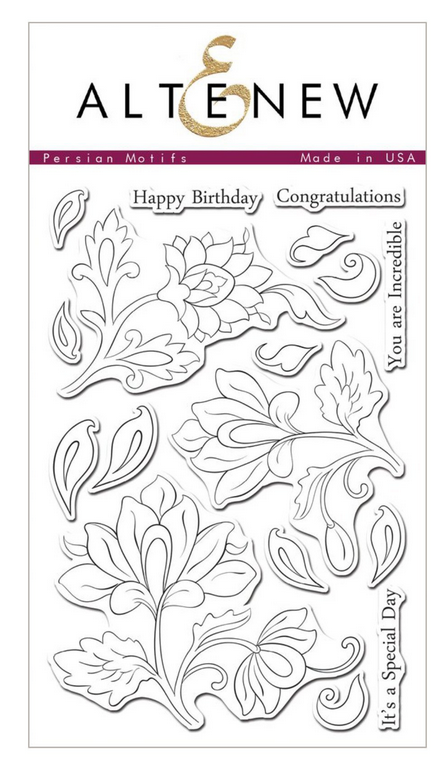 Using a Misti or any stamp positioning tool will come in handy for these layered stamp sets. Before assembling the flowers and leaves, I used the Classy stripes stencil with texture paste tinted with Dew Drops to add some texture to the background. Black ink was splattered for more contrast. Foam tape was used to adhere the elements to create layers. Here’s a tag I made using the Beautiful Day stamp set and the thin frames die set. The image was stamped twice and the center portion of the flower was cut to add a second layer to the flower. Wet on wet technique was used to color the petals and Nuvo drops to add dimension to the anthers of the flower. Foam tape was added to the center layer for more dimension. The leaves were stamped on vellum using clear embossing ink then embossed with gold embossing powder . Altenew thin frames were layered at the back of the tag to add more contrast and dimension. 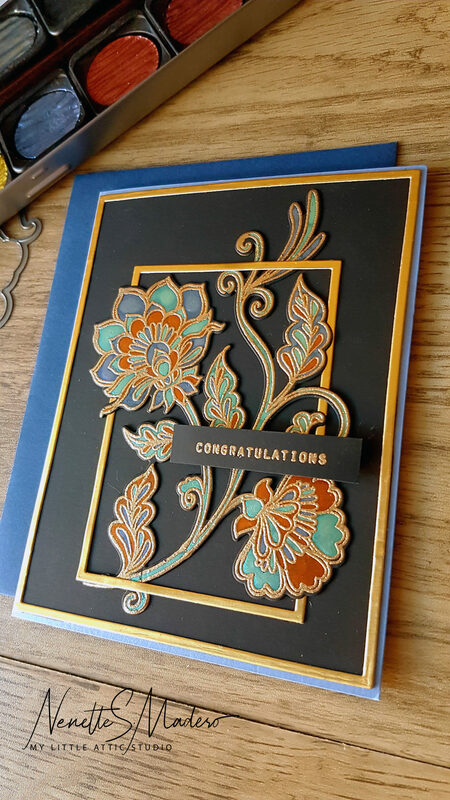 The Altenew Educator Certificate Program was a wonderful way to hone my skills as a card-maker. There was a variety of classes to choose from and each class was filled with so much inspiration, amazing tips, and techniques. The beautiful thing about this program is that you go at your own pace but because the classes were so inspiring, I couldn’t wait to start the next class!!! 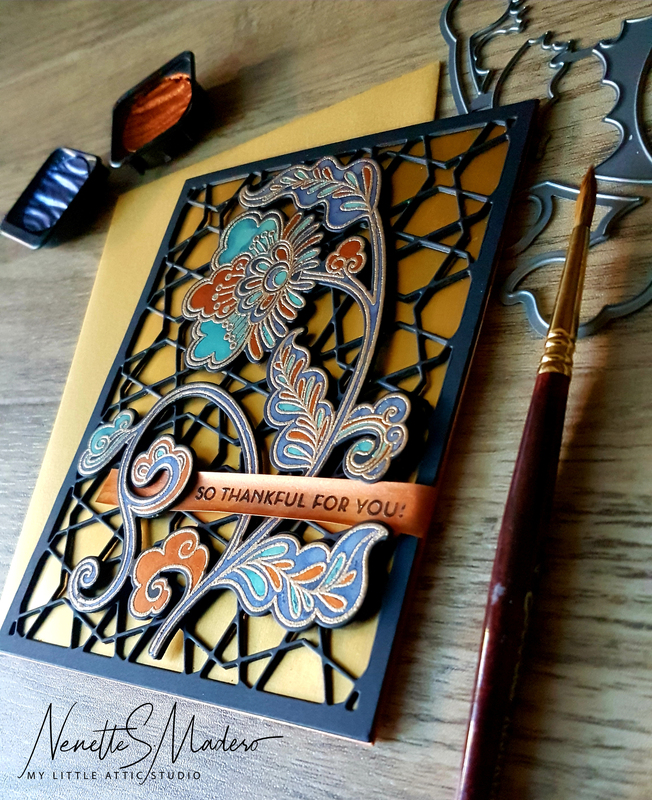 I learned so many techniques from the fabulous instructors and whatever knowledge I gained can be applied to both cardmaking and scrapbooking. To move to the next level, there were challenges that inspired me to think outside the box. All throughout the program, Virginia Lu (AECP coordinator) and Nicole Picadura were always there to answer questions, give encouragement, inspire, and support. Their words of encouragement were vital in pushing me to finish the program. I highly recommend this program to anyone who strives to get better in their cardmaking skills. I will also be choosing a winner who will receive a $15 gift certificate from Altenew. Let me know what your favorite Altenew product is in the comment section below. Make sure your comments are in by 11:59pm EST on Jan. 21, 2019. The winner’s name will be randomly chosen and posted here on my blog by Jan. 22. International participants are welcome to join!!! P.S. Do drop by and say hi! Your creations are truly fabulous! So many different techniques & such gorgeous results! I love them all! The Beautiful Day tag is my favorite, maybe because that’s my favorite Altenew set. Thank you for sharing all this beauty! Nenette, your projects are stunning! I especially love the metallic on black background, that makes the colors of the flowers really stand out (I also love this technique). So proud to call you an AECP sister! Hi Michelle!!! I am humbled to be a part of the AECP family. I love that!!! AECP sister!!!! I’m a fan of your work and I look forward to getting more inspiration from your works of art. I really love cards 2 and 3 with the dramatic colours on the black! <3 <3 <3 And I love the stenciling on number 4. Thanks for sharing. There seems to be something wrong with your subscribe by email box – maybe because so many of us are joining we all broke it. Wow – your work is very inspiring! So lovely! I do love Altenew and one of my favorite products of theirs is watercolor brush markers! Thank you! Hi Lee!!! I’ve heard so much about these watercolor brush markers and I can’t wait to try them myself! Beautiful Day is a gorgeous set. Love the tag you created. Absolutely gorgeous. TFS. What gorgeous cards! You did a great job of teaching us how you created these wonderful cards! Congratulations on your achievements! Thank you for your kind words, ajoyfullifegives! Sharing what I know gives me great pleasure 🙂 Do you have a favorite Altenew product? Outstanding cards! No wonder you are an educator. Thank you, Vicky! Do you have a favorite Altenew set? What beautiful cards!!! Thanks so much for sharing! I adore the card on the black cardstock so inspiring and great composition. So happy you like it, Caroline! Girl, I am speechless. Your cards and FABULOUS!!! OH MY GOODNESS…………..
By the way, I am having serious problems and trouble subscribing to your blog via email. I don’t know what else to do. Can you sign me up??? Thank you so much, Kayethrasher! Wow! I love your gorgeous cards so much that I have decided to follow your blog! Beautiful blends of texture and colors! I am very impressed! Gorgeous cards, tag and layout! Love your fabulous colors combos and details! The Needlework Motif designs and black paper look fabulous together! What fabulous cards! Your designs and color choices are absolutely stunning. I am saving your post to read again since it’s so inspiring! I love seeing projects using the Moroccan elements and the Needlework stamps work so well with them! Congratulations on your wonderful videos, too! I remember the release Altenew did & these two stamp sets & dies were & still are my all time favourites. Bravo & very well done! 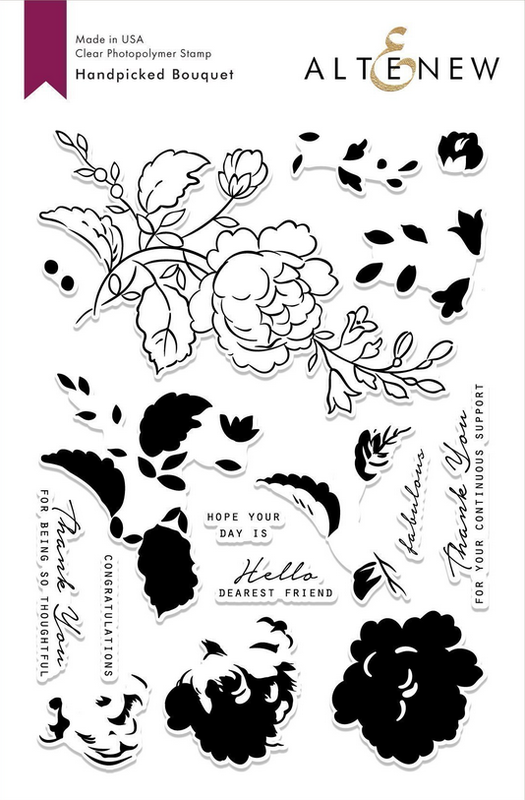 Beautiful–love what you created with these stamp sets. Amazing! You have chosen some great stamps and created simply beautiful cards. Thank you for sharing your talent with us. Wow! you’re cards are totally delightful, I love every design element you used in all your cards. I am inspired and can’t wait to get crafting. 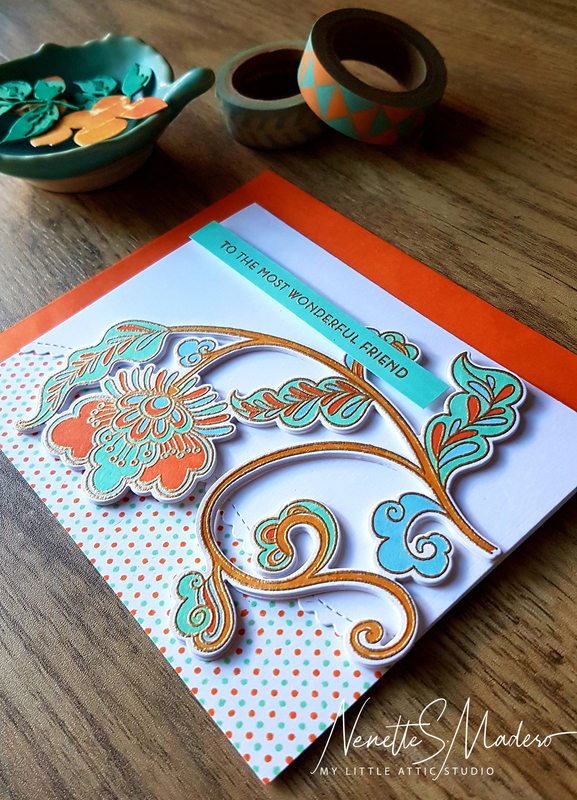 The Beautiful Day stamp set and dies are one of my favourites. Thanks for sharing your amazing cards. 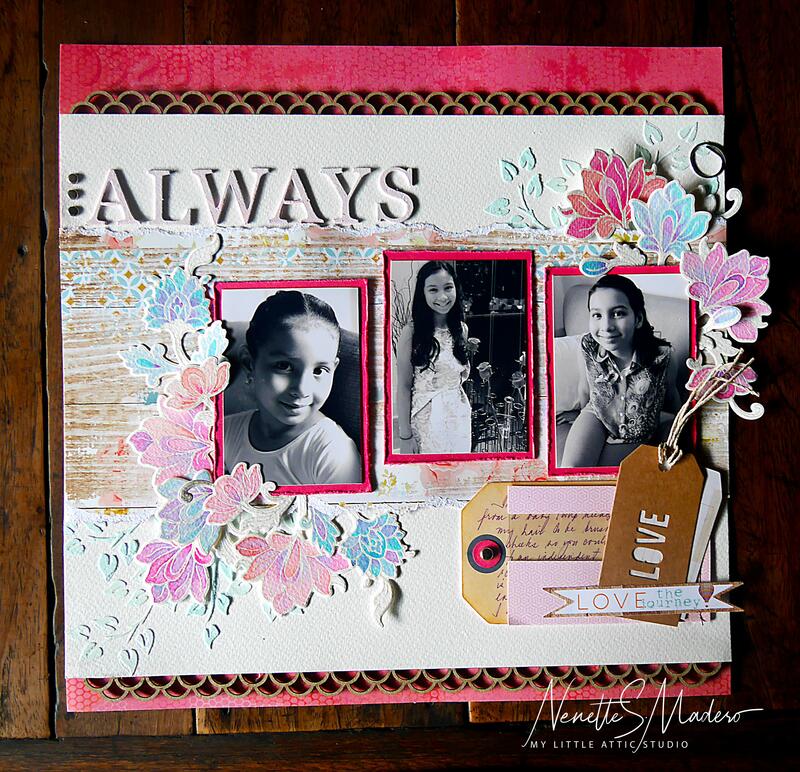 WOW Nenette, your work is absolutely stunning from your gorgeous cards to your layouts and tag! (I tried a few times to subscribe to your blog but it keeps saying ‘page not found’??? I’ll have to try another day! TFS! Hi Teresa!!! Thanks for letting me know! I will have the site checked to figure out the problem. Please make sure to come back. I will be posting projects more often now. 🙂 Thank you for your kind words!!! OMG!!! Every single card, scrapbook page, or tag is stunning. You amazed and inspired me with your wonderful talent. This is my first ime to our blog, but I will be subscribing and returning. My head is still spinning with the beauty that I saw. Thank you. Awww…. so sweet BrendaLea!!! I’m so touched with your kind words <3 Hope you drop by again soon! Do you have a favorite Altenew set? All of your creations are so beautiful and vibrant! Thank you so much for sharing your talent! Thank you so much, Susan!!! What’s your Altenew favorite? Oh these are super! I love the Beautiful Day set and I think I want the Handpicked Bouquet set now after seeing your idea. Love your projects, so beautiful! Thanks for video tutorial! Congrats on being an Altenew Educator! Beautiful projects! I especially love card 2 & 3 with the pearlescent watercolors on black! Thank you so much memalagene! Do you have a favorite Altenew set? Congratulations on accomplishing Certified Educator status. Your tips, techniques, and elegant execution certainly represent this line of products beautifully. I will be following you for inspiration as I pursue excellence in my own card making! Thank you so much, sbrussell!!! Do you have a favorite Altenew product? Oh My God,everything showcased here is super gorgeous,thanks for sharing and congratulations for your achievement as well!! Thank you so much, anushreevaish! Do you have a favorite Altenew product? FIRST Blog Hop AND FIRST video??? YOU ACED both of them! Love your cards and that gorgeous scrapbook page, and your instructions and photography are so clear and understandable. I will be coming back often to try to learn some of your awesome techniques. I did try to join your mailing list but it didn’t work (?) Mail chimp came up but went nowhere. Thank you so much for your amazing inspiration….can’t wait to see more of your work! Hi knurse22!! Thank you for your kind words! I’m working on trying to fix the issue regarding subscription. Thank you so much for dropping by! Gorgeous job coloring! This is a beautiful card. Congratulations on completing the educator program! Thank you, Carmela! Let me know what your favorite Altenew product is! All of your projects are amazing. The colors are beautiful and the styles so unique. Thank you Cyndi! Do you have a favorite Altenew product? Beautiful cards and I learned so much from your post. Thank you Dana! Please let me know what your favorite Altenew product is! Congratulations on becoming an AN Educator Nenette! Lovely designs. This is such a wonderful array of creations I am mesmerized by all the dimension and texture you incorporated on each and everyone! Thanks for the inspiration and for the giveaway! Beautiful cards! Congratulations on becoming an Altenew Educator! Thanks for the inspiration and for the opportunity to win! I appreciate the tip of stamping a lighter color multiple times to achieve a darker color! Great tip! I do adore my Misti! Hi Carney! 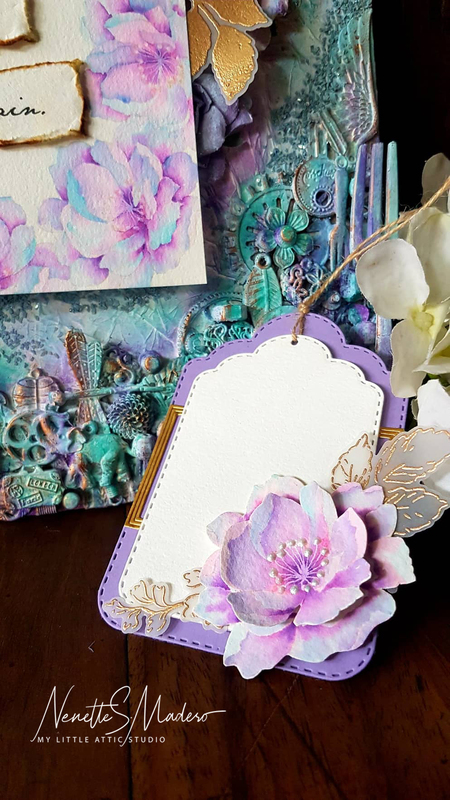 Glad to be able to share some tips on cardmaking! What’s your favorite Atlenew product? Love your card favorites so much that I had to follow you on Pinterest. So inspirational, I can’t wait to use some of your techniques. Thanks for sharing! Thank you so much, Kandice!!! Appreciate it! Please let me know what your favorite Altenew product is! Oh my, these are stunning with the gorgeous colors and design! Am so in love with these!!! So many different ways you impressed me with these! Gorgeous work! So happy you liked my projects, Beverly! Let me know what your favorite Altenew product is! Your creations are beautiful. Love all the dimension and colorful pallet you used. Book marking your blog on my favs. So sweet of you, Chai! Glad you liked them! Do you have a favorite Altenew product? Thank you so much for your kind words, Chai! Comments like yours give me more inspiration to create. Thanks for dropping by! Nenette, you did an amazing job with your first blog hop . Your are so talented and your art sense is so high . All your creations were perfectly perfect and stunning. 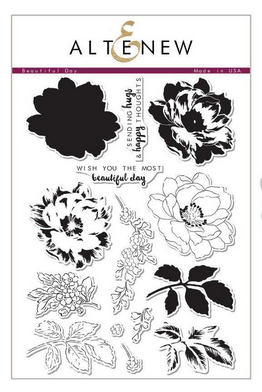 Love the idea of having the die cut flower next to stamping ones . So unique. Love all the amazing details on your 2nd card . And as I am a few fans of scrapbooking layout. You did an amazing creation. Wash to ho . Do proud with all the effort you made in this post ..
WOW! These cards are stunning! I love the stamp set from the first card. Much different actually seeing it stamped out than on the stamp sheet. So true brightdesignstudio! I immediately fell in love with the intricate designs which can be easily achieved in 1 stamp impression. So cool!!! Thanks for dropping by! Thank you so much for appreciating them and for dropping by, Mogsya! Great cards. Loving the stamp sets you used.